THE PICKIEST EATER IN THE WORLD: ACACIA HOTEL: BUFFET AT ACACI.. AND ANNIVERSARY GIVEAWAY #9! 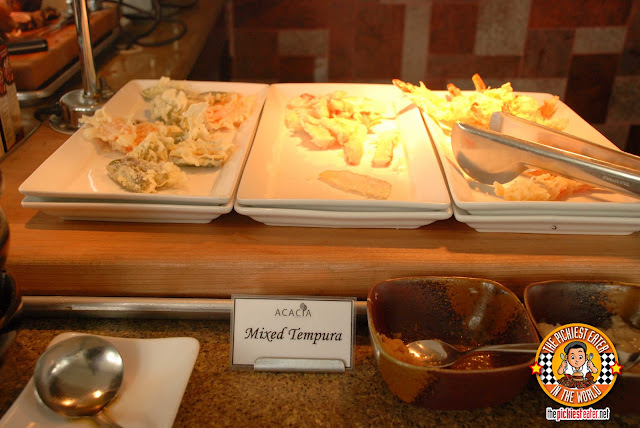 ACACIA HOTEL: BUFFET AT ACACI.. AND ANNIVERSARY GIVEAWAY #9! To Rina and I, travelling to the South is pretty much an out of town trip to us. Which is why when I visited Alabang a few months back, I was left in awe when I saw someone dropped a Five Star Hotel in the Filinvest area. Acacia Hotel sprouted out of nowhere to become one of the premiere hotels in the South. For me, it would make a nice place for a "Staycation", if in case Rina and I just want some peace and quiet. I was pleased to find that Acacia Hotel also has a restaurant in it, called Acaci. With my weakness for hotel buffets taking over my senses, my trip to take Acaci's buffet a little spin was inevitable. You might want to keep reading, because by the end of this post, I'm hoping I said enough to make you want to join The Pickiest Eater in The World's Giveaway #9!! Acaci is the cornerstone of Acacia Hotel's culinary campaign of excellence. The cafe, located at the hotel's mezzanine area, is luxurious dining area, with high ceilings and beautiful picture windows that span across virtually the entire side of the building. The windows allows for the sunlight to beam into the restaurant, giving it a fresh, and vibrant ambiance. 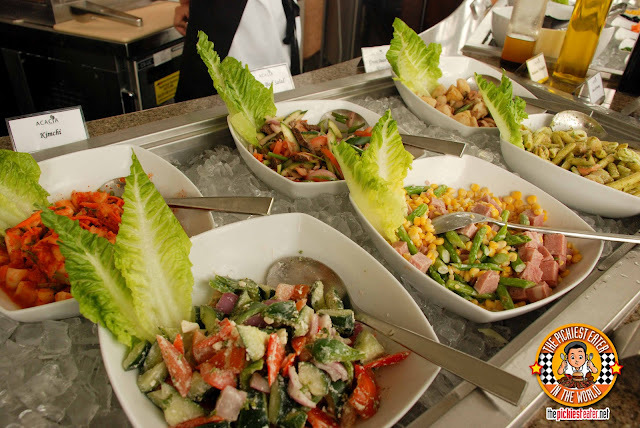 For starters, people who enjoy their greens before a meal will get a kick out of Acaci's salad bar. Among the choices were Beef Salad, Kimchi, and Potato salad. Rina bet me P50 bucks that I wouldn't eat anything from the salad bar. I promptly came back to the table with some Pesto Penne salad, and a roasted corn salad with cut up chunks of ham. Acaci also boasts of a cold bar with fresh seafood and other appetizers. I'm not too fond of shrimp and mussels, but Rina got a kick out of it. For carnivores like me, cold cuts and bread are a good way to start the meal. I was particularly found of the salami! 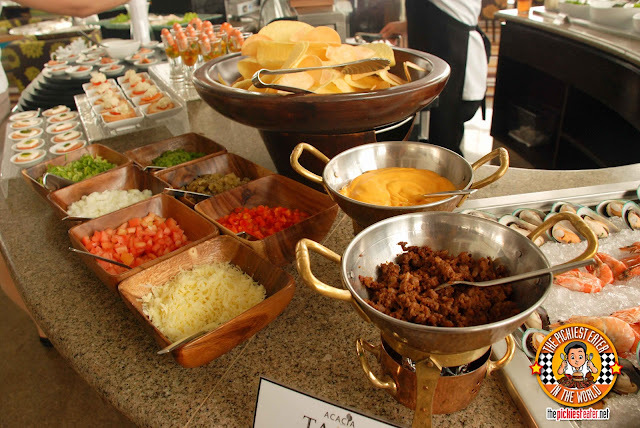 A Taco Station isn't exactly something you'd expect to find at a Five Star hotel buffet. But in my opinion, its what makes Acaci unique. I actually just crumbled some taco shell, mixed in some meat with the cheese and cheese sauce and made me a taco salad. Yet ANOTHER P50 bucks in my pocket. Cha-Ching! Rina was delighted to find a Pasta Station. 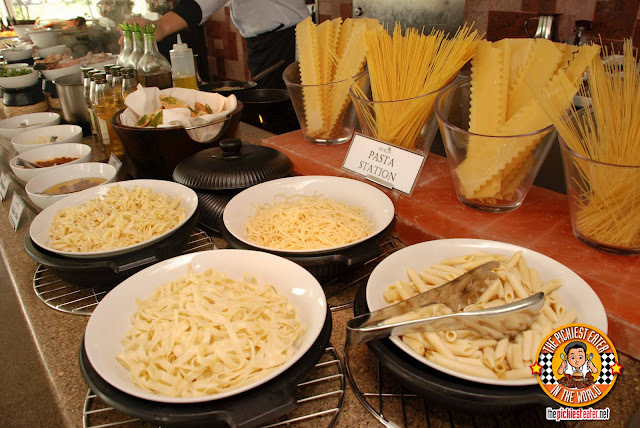 The station offered different type of pastas, and a nice selection of sauces to choose from. As expected, Rina went straight for the Creamy Carbonara. Yet another interesting Station set up by Acaci was the Sinigang Station. You can basically customize your own Sinigang to your liking.. Shrimp, pork, etc.. 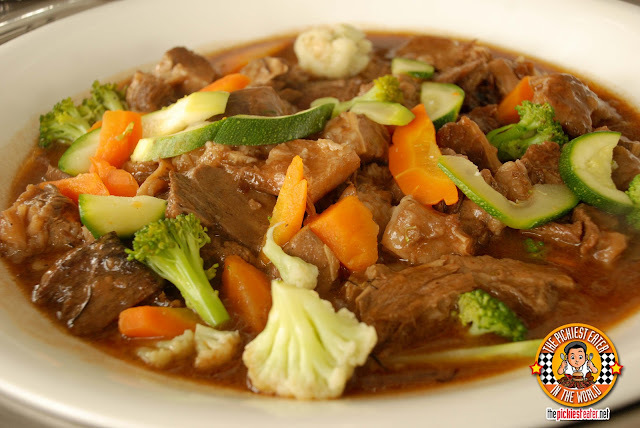 The strips of beef in the Red Wine Braised Beef Stew were reasonably tender, and the medley of the vegetables, which included carrots and zucchini, gave it a hint of sweetness that melded well with the acid brought on by the tomato based sauce. The Steamed Cream Dory was quite delicious. The Dory itself was amazingly soft, and the herbed cream sauce coated it beautifully, and enraptured it with flavor. Acaci had a deliciously different take on one of my oriental cuisine favorites, Lemon Chicken. 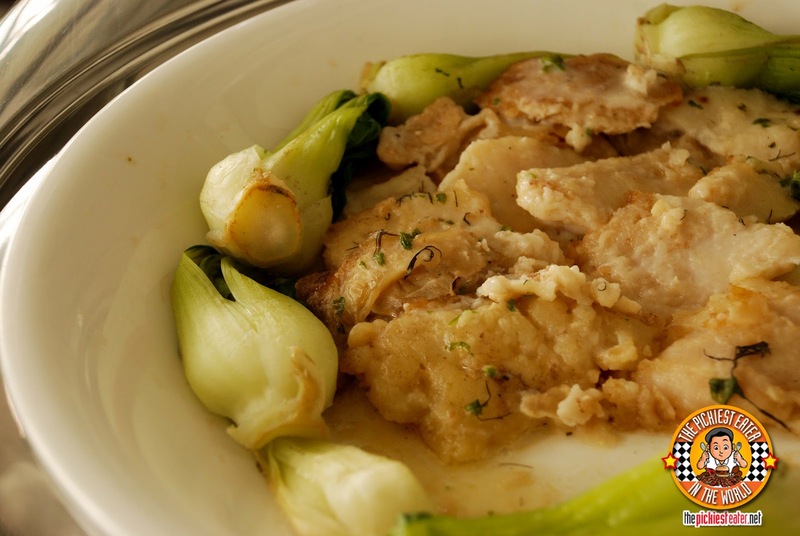 Instead of chicken fillet cutlets bathed in a heavy lemon sauce, this was more like pan fried chicken, drizzled in a lightly sweet, citric sauce. Another thing I look for in a hotel buffet, is a good carving station, and much to my elation, Acaci had two types of dishes up for slicing for your eating pleasure. The first was Lechon Kawali. 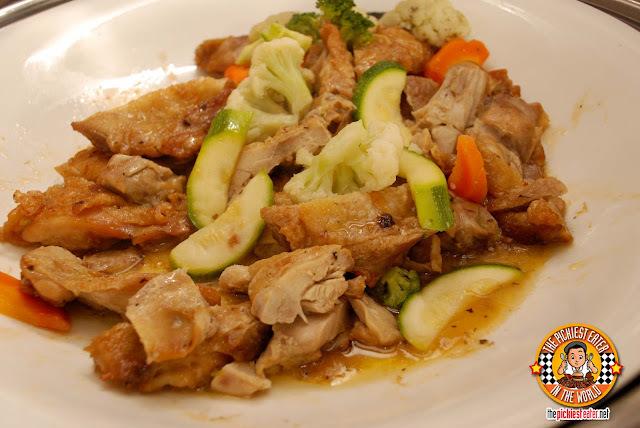 One would be surprised to hear that despite being a huge fan of pork, I'm not all that crazy about Lechon Kawali. I don't like how the meat is a bit too dry, and the fat is too oily. 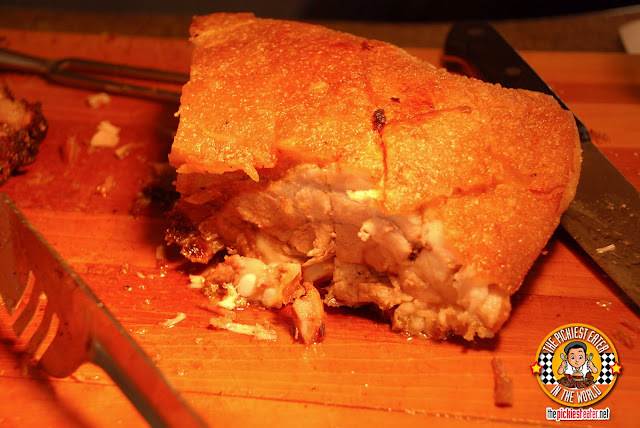 Acaci's Lechon Kawali though, was different. Since it was still in a slab and sliced for the guest upon request, it wasn't dry at all. The meat was in fact, quite moist, despite not being overloaded with fat, while the skin crackled with every amazing bite. An amazing aroma emanated from the giant slab of Acaci's Roast Beef. 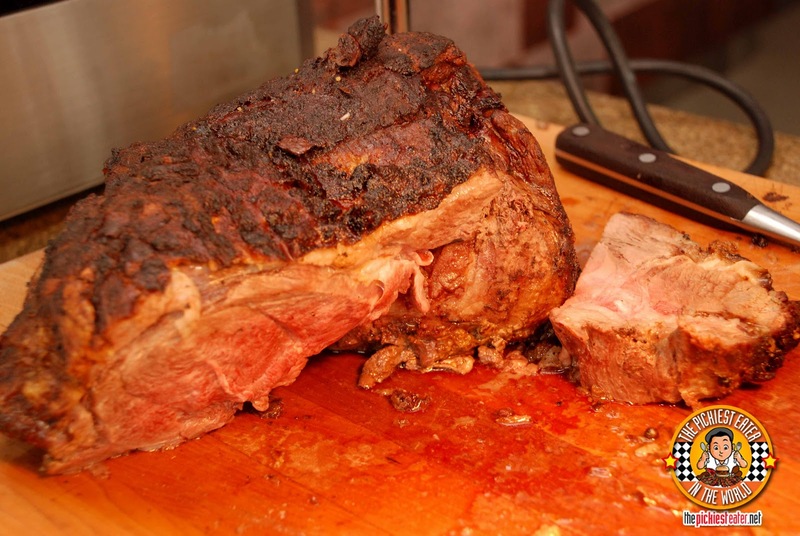 It was a beautifully juicy cut of beef whose innate flavors really didn't have the need for gravy. Word of advice though.. Don't get the pre-cut slices. 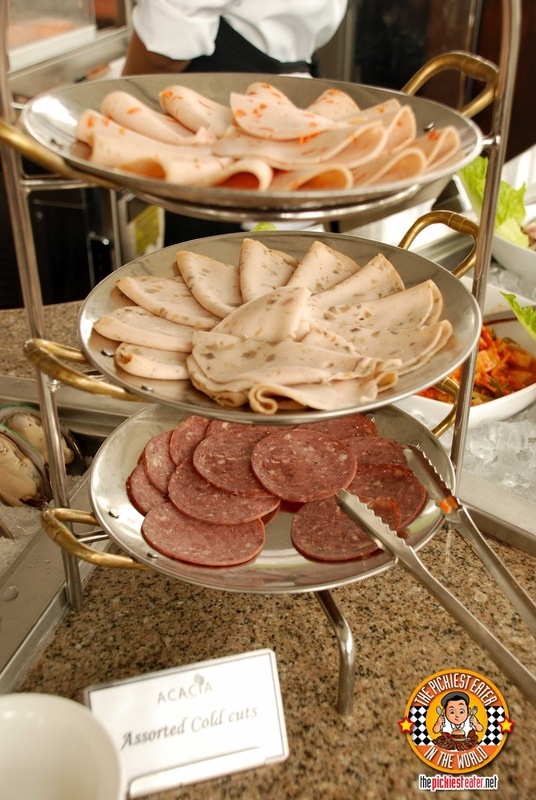 Ask for a freshly sliced one, because when left out for too long, the pre-sliced ones tend to dry up quickly. 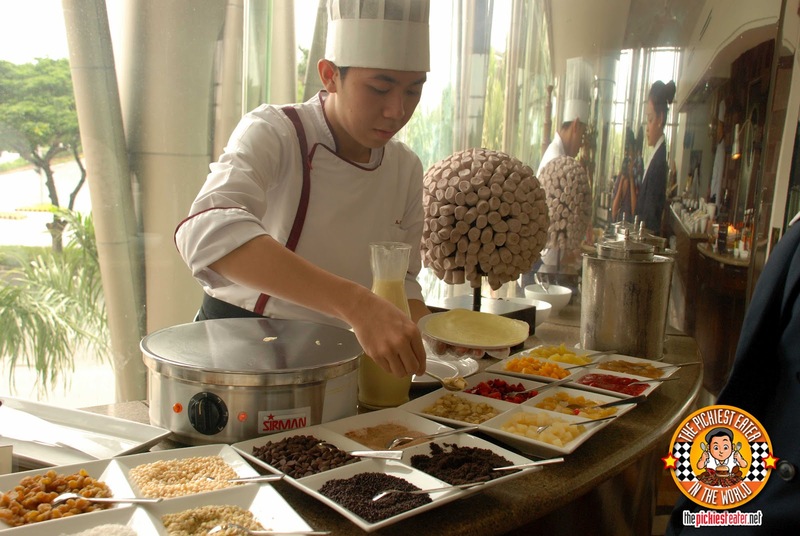 For Dessert, apart from the wide selection of pastries to choose from, Acaci has a crepe station that offers several types of fillings and toppings, ranging from fruits to chocolates. And another restaurant staple is of course, the Chocolate fountain station, that offers several fruits and sweets, all primed for taking a decadent dip into the running choco goodness. 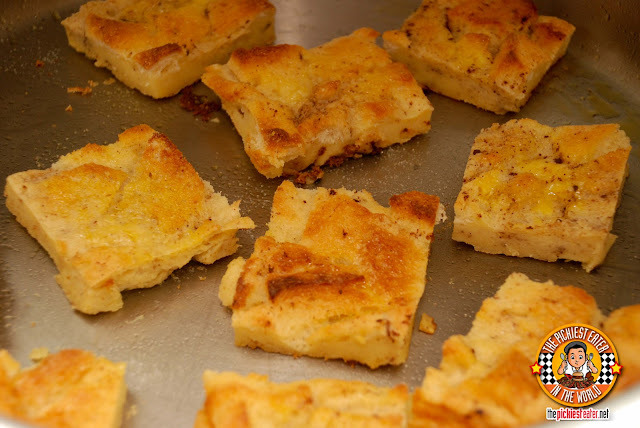 But by far, my favorite dessert was the bread pudding! I hadn't been to this many stations since Holy Week! But Rina and I did have a wonderful time. 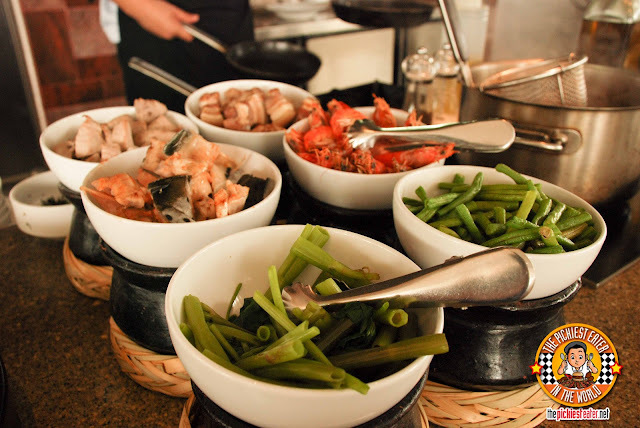 The Acaci Buffet is something that I wish everyone could experience..
At P995 Net, It's one of the more affordable Hotel buffets in the metro.. but I'm giving away FREE gift certificates for a buffet Lunch or dinner for two at ACACI... for TWO Lucky readers!! How do you join? Just follow the Rafflecopter widget! The Contest runs from today, September 3, until 12 noon of September 22, 2012.
oooh love the pasta station! Found it a little funny that the first picture I saw was the salad bar! I would bring my sister, an HRM major because I want her to see the best service Acacia Manila Hotel has and the delicious food they serve. It could help her and inspire her more in her course. if i will win I will bring my boyfriend to celebrate our monthsary at Acaci. Love buffets!!! Can't wait to try it!!! crunchy belly station nalang kulang!! If i win, ill bring my mom with me because we love foods and also we can enjoy and fulfill our hungry tummy while having a good time! How interesting! 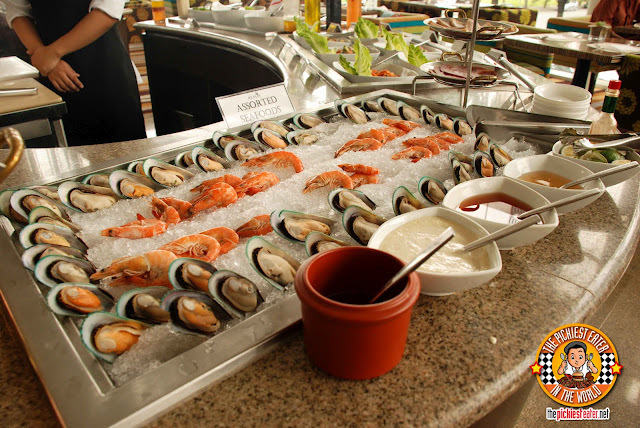 I'd probably enjoy the taco station a lot and a good seafood station at buffets is always a hit for me. If I win I'd bring either my sister (we are both foodies) or my fiance with me. I would bring my hubby because we seldom eat out due to financial constraints. Ill bring along my sister. Perfect bonding! If I win, I'm going to bring my husband with me. We've been working and taking care of our 6-month-old full time, so we hope we can finally go out on a date! I would bring my best friend for more bonding! I am not yet sure who to bring! I would like to take my mom to Acaci. It's the best place to catch up with her. i miss her so much. She means so much to me. I i win i would take my fiacee! i would take my hubby Keith so he can enjoy a Filipino hotel with world-class facilities and of course revel in the Acaci buffet..;)!!! I would take my beloved sister who's graduating from college on October. I'll bring my mommy with me, she would probably like this coz she loves buffet. If I win, I will bring my Chinese husband with me who loves Sinigang so much! Please let me win. Thanks! i will bring my tatay, i never treat him!!! First off, I'd be so stoked to try the taco and the sinigang station! my mom! :) she loves to try new places, new food. I want her to have a great time. If I win, I'd take my boyfriend as a gesture of gratitude for his unending love and support. If I win, I will take my wife with me. Please let me win! Thanks! I would bring my Mom because all her life as a mother, she's been busy in cooking for our family's everyday meals. I want her to have a stress free moment by bringing her in this restaurant. If I win, I'd bring my blockmate who also happens to be my roommate and my good friend. This would be the perfect reward for all our toil in law school. Perfect cure for the post-midterms blues. Living by our principle of delayed gratification would then definitely pay off! 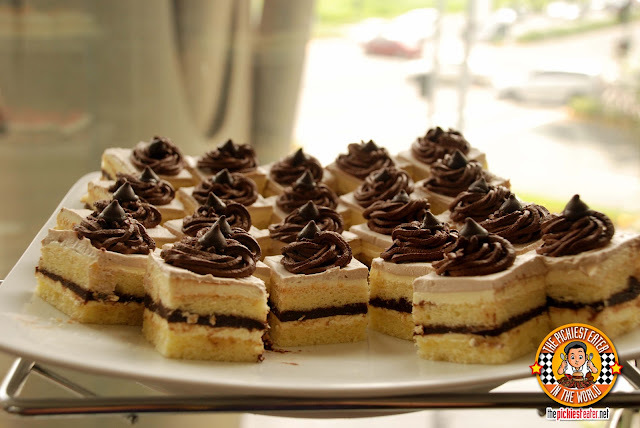 Plus, we're such happy eaters that this BIG of a treat would be heaven to our taste buds!!! My girlfriend because we love to eat! If I would win, I will give the tickets to my parents. This will be a symbolic gift of their love and passion for molding me as the person who I am right now. This will be one of my thank you gifts for them. However, my tokens of gratitude will not end here, rather it will last forever. 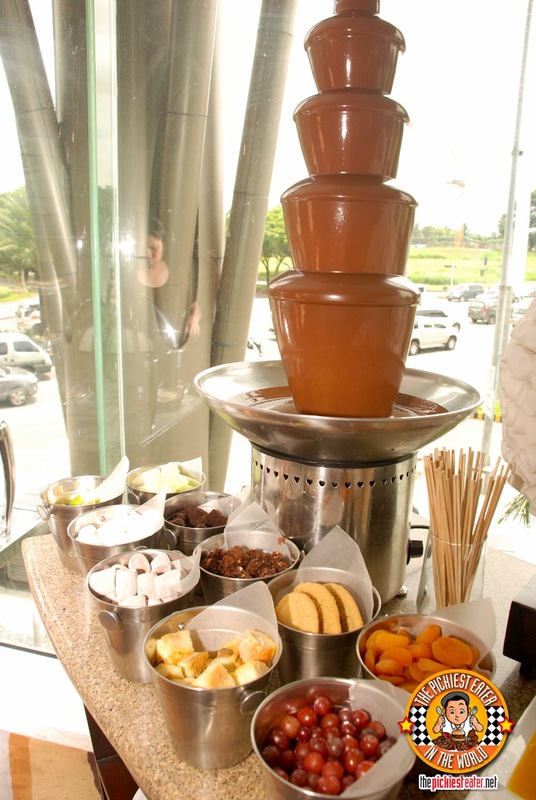 I'll bring hubby!=) yummmmyumm buffet! 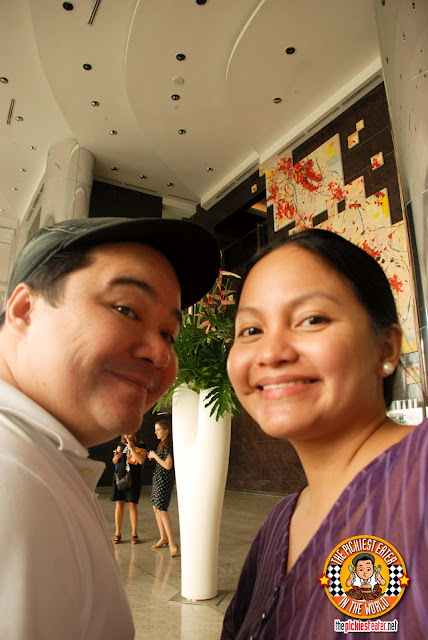 I'll tag along my food trip buddy - my hubby! Would bring the boyfriend with me! I would love to take my boyfriend with me! He is the best man I have ever met! He's not a fan of fancy restaurants so I want him to experience something like this so that he can take me ALL THE TIME to a sosyal resto! (*evil laugh*) Just kidding!! :D I just want him to be with me for this awesome experience! And we have never been to a buffet type of restaurant so that would be awesome!!! i would like to bring my hon SHO tsuchiya ever since i gave birth to our son shin we didn`t able to go out together. 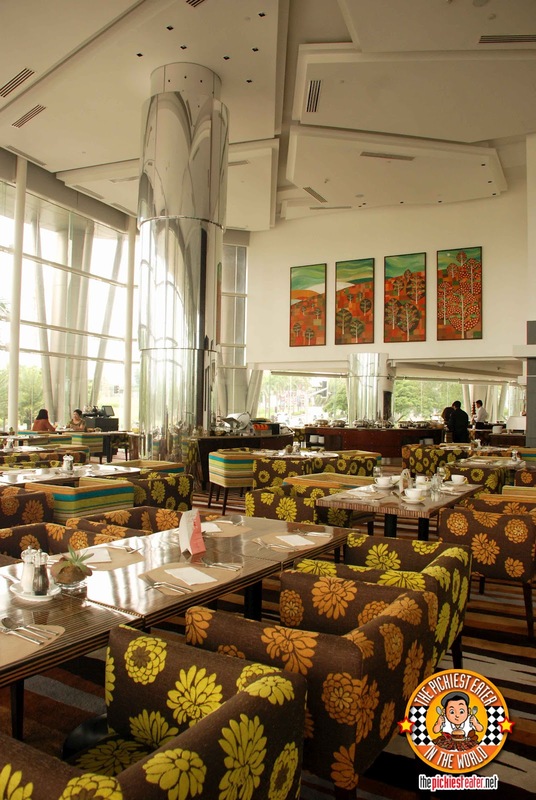 i wonder whats the feeling or experience eating in the ACACIA HOTEL MANILA. in november 26, 2012 our 3rd yr anniversary!.. thanks for this giveaway! more power & god bless. if I win ,i will bring myself.. I would definitely bring my mom with me. If you win, who would you like to take to Acaci and why? i will take Sam Pinto with me! hope she'd be available. I will bring my son Rafael who loves to eat in a buffet restaurant and it's a treat for his 18th birthday! Wow! I'm so excited to try this restaurant.. If I will win, I would bring my partner, we both love to eat and eat and eat..
if i win, i will bring my husband so that we can celebrate our 6th year wedding anniversary....exact date will be this Friday, 7th of September. I'd definitely bring my siblings here. We love to eat and we love eating together most of all. In fact, most of our trips here and abroad are food-centered most of all. We love good food and would go to great lengths to try new things, even the weird ones. The Acaci experience would be a great addition to the already overflowing record of good eats that we keep. If I win, I'd bring my husband along because I can't think of any other person in the world to bring aside from him! Hahaha! If I win, I'll take my husband with me. It would be the best treat since we're about to celebrate our 3rd year wedding anniversary! I would love to bring my hubby and our 3 daughters. I' sure we will all love it here. I would like to bring my mom who is turning 50 this october! Birthday celebration at Acacia Hotel! if i win, i would really wanna do it with my mom..it has always been our dream to go to a hotel and, of course, eat.. If I win, I would definitely dine in the Acacia Hotel with my beloved fiancee <3. If I win i'd bring my best friend with me! We would be spending a great time together eating (as always). Sinking our teeth on those enticing entrees! I am on a mission: To make my boyfriend gain weight. We've been together for almost 3 years now, but until today, he has not added up any pounds -- just me, ALWAYS. I don't mind coz I really love food. But I am not giving up... I want him to enjoy food as much as I do, and hopefully he could look "healthier" by adding on a little lbs. So, if I do win, I'd really, really like to bring my boyfriend with me and we'll try to taste everything that Acaci has to offer. If I win, I'm taking my husband with me because love for good food is something we share! I'd love to take my husband out to dinner if I win the prize. If I win this giveaway (wishing that I do) I'll bring my mom. If I win, I'd bring a friend with me who loves to eat too. I am from the South but I havent been in the Acaci...looking forward much. I'd love to bring my husband on a date with me, we hardly see each other cuz of work! I'd love to bring my husband so we can have some more quality time before our baby arrives. If I win, I would like to bring my husband because he deserves it. He worked for his family 24/7 and he needs a total break. If i win i will definitely bring my husband along! We both love trying out food from different restaurants and places, this ill b a very nice surprise for him for our second wedding anniversary, hope i win! If I win I'm going to bring my best friend because she's had a rough time these past few months and she really needs a lot of cheering up. I didn't have to think twice about this one. I'm taking my husband who loves buffets! If I win, I want to bring my brother with me so we can catch up while enjoying the food because I haven't seen him for a long time. My friend would really loved eating. I like to bring my girlfriend to Acaci. Her birthday is so near and this will be the greatest opportunity for me to surprise her. 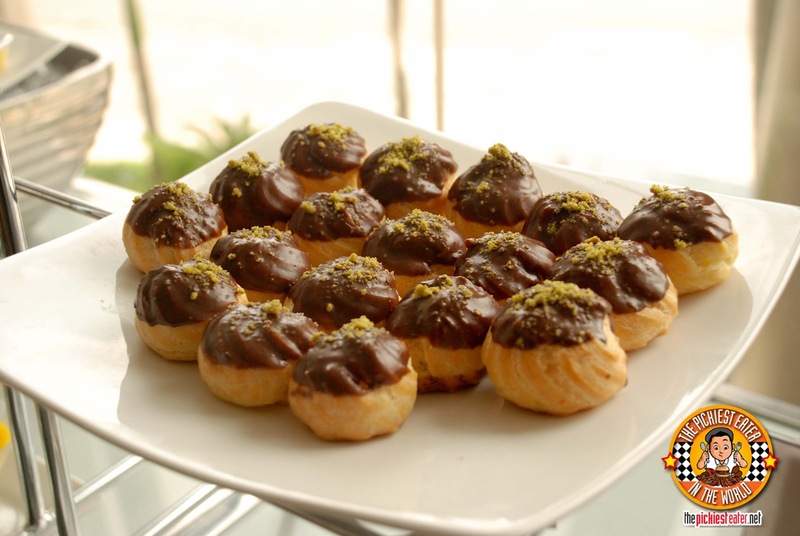 She is a food lover and definitely she'll love your treat. I'd take my girlfriend since eating together is somehow a very important part of our relationship. I'll take my hubby with me and have a great time in your place. Why? Who better to enjoy one of the best things life can offer (food) than the person who endured 9 months of hell to give me life? I will definitely bring my husband I I got lucky to win this. We both love to eat specially buffets like this. Whoah! I would bring my mom or GF, whoever fits the schedule. I would bring my Husband coz we both love eating, sana manalo! I will bring my Dad since I want to spend more time with him and I want to make it up to his birthday. I will bring my wife. if i win i will take my mom with me. i love my mom so much and she always deserve to be treated special. though she's not here coz she's in our province right now, i always wish to be bond with her, to hang out with her coz i miss her so much. I would bring my beloved girlfriend! If I win (crossed-finger), of course I will bring with me my hubby! I would bring my parents because I love them and we love eating! i would bring a special someone and it would be my peace offering. i will bring my dad at this hotel coz we have no time to bond. I would love to bring my husband here as part of our 6th anniversary. I would bring my cousin with me if I win cause that's what we do best - EAT! I will bring my hubby with if I win.